The beauty needs a daily attention. As a real rejunevation treatment, the new generation of the 2B Bio Beauty® cares defers the visible signs of skin aging. 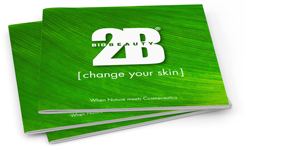 Thanks to their well-formulated active ingredients of high technology, the 2B Bio Beauty® products match all modern men and women expectations, whatever else their age, skin type or environment. Thanks to our expertise, we suggest an ultra-performing treatments program as well as guaranteed and splendid results.